An Act to amend and consolidate the law relating to legal practitioners and to provide for the constitution of Bar Councils and an All-India Bar . (1) This Act may be called The Advocates Act , 1961. (3) It shall, in relation to the territories other than those referred to in sub-section (4), come into force on such date as the Central Government may, by notification in the Official Gazette, appoint, and different dates may be appointed for different provisions of this Act. (4) This Act shall, in relation to the State of Jammu and Kashmir and the Union territory of Goa, Daman and Diu, come into force on such date as the Central Government may, by notification in the Official Gazette, appoint in this behalf, and different dates may be appointed for different provisions of this Act. Statement of Objects and Reasons.-The Bill seeks to implement the recommendations of the All-India Bar Committee made in 1953, after taking into account the recommendations of the Law Commission on the subject of Reform of Judicial Administration insofar as the recommendations relate to the Bar and to legal education. (5) the creation of autonomous Bar Councils, one for the whole of India and one for each State. 3. Following the recommendations of the All-India Bar Committee and the Law Commission, the Bill recognises the continued existence of the system known as the dual system now prevailing in the High Courts of Calcutta and Bombay, by making suitable provisions in that behalf. It would, however, be open to the two High Courts, if they so desire, to discontinue this system at any time. 4. The Bill, being a comprehensive measure, repeals the Indian Bar Councils Act, 1926, and all other laws on the subject. 5. The Notes on clauses explain, wherever necessary, the various provisions of the Bill. -Gaz. of India, 19-11-1959, Pt. II-Section 2, Ext., p. 1186. Act 14 of 1962.- The Advocates Act. 1961 provides for an autonomous Bar Council in each State and an All India Bar Council consisting mainly of the representatives of the State Bar Councils. Under the Act, a State Bar Council is to enroll qualified persons as advocates and prepare a oil of advocates practising in the State and thereafter common roll of advocates for the whole of India is to be prepared by the Bar Council of India. The Advocates whose names are entered in the common roll would be entitled as of right to practise in all the Courts in India including the Supreme Court. 2. Provision was made in the Act for its enforcement piecemeal and Chapters I, II and VII which provide for the constitution of Bar Councils and certain transitional measures were brought into force on the 16th August, 1961. It was expected that all the Bar Councils would he constituted by December, 1961 and a common roll would be prepared soon thereafter. On that expectation, Chapter III which relates to the admission and enrolment of advocates was brought into force on the 1st December, 1961. The expectation has not however been realised. One of the State Bar Councils is yet to be constituted and the Bar Council of India could not therefore be formed. 3. The delay in the constitution of Bar Councils and the preparation of the common roll has created certain difficulties. Where a State Bar Council has not been constituted there is no authority to enrol qualified persons as advocates and even where such a council has been constituted it cannot function effectively in the absence of proper rules which require the previous approval of the All India Bar Council. Moreover, even when it person is enrolled as an advocate on a State roll, he will not be entitled to practise until his name is entered in the common roll and Chapter IV is brought into force. 4. Difficulties, therefore, arose in the enrolment of proper persons as advocates and in conferring on them the right to practise. Since sections 6 and 7 of the Legal Practitioners Act, 1879 stood repealed from the 1st December, 1961 when Chapter III was brought into force, doubts arose whether the certificate to a pleader or a mukhatarcould be issued or renewed after that date. Thus unforeseen difficulties were causing unintended hardship to certain persons and it was considered necessary to take immediate action to amend the Advocates Act, 1961 by promulgating an Ordinance. The Advocates (Amendment) Ordinance was accordingly promulgated on the 24th January, 1962 for making suitable transitional provisions to overcome the difficulties which arose in the working of the Act. This Bill seeks merely to replace the Ordinance by an Act of Parliament. Opportunity has been taken to make certain minor drafting changes in the Advocates Act. - S.O.R. Gaz of Ind.. 12-3-1962, Pt. II, S. 2, Ext., p. 12. 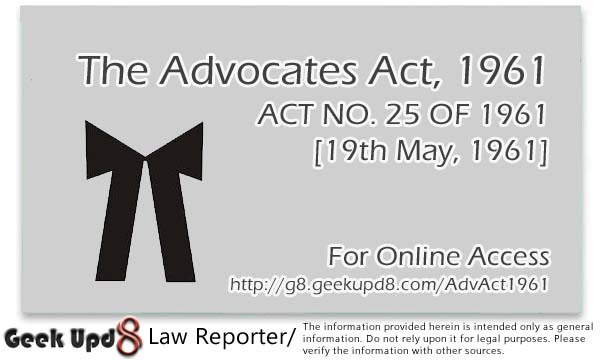 Act 25 of 62.- Under section 24(1) of the Advocates Act, 1961, in order to be admitted as an advocate on a State roll, a person must have obtained a degree in law and undergone a course of training, and passed an examination, prescribed by the State BarCouncil. Underthe proviso to that section, however, persons who have obtained their decree in law from any University in India before the appointed day, that is. the 1st December, 1961. when section 24 was brought into force, are entitled to be admitted as advocates even without having undergone the prescribed training and passed the prescribed examination as aforesaid. The final L.L.B. examinations ofthe three Universities in die State of Maharashtra, namely, Poona, Marathwada and Bombay were held in October, 1961. The results of the first two Universities were published in November, 1961. Accordingly, the students of those two Universities who passed the L.L.B. examination held in October, 1961, were entitled to be enrolled as advocates. But the result of the L.L.B. examination of the Bombay University was published on the 12th December, 1961. the consequence being that the students of that University who came out successful in the L.L.B. examination are not eligible to be enrolled as advocates without the prescribed training and examination. This has caused unintended hardships on, and discrimination against, the students of Bombay. It is accordi ngly proposed to amend suitably sub-section (I) of section 24 of the Advocates Act, 1961, so as to provide that those who passed their final law examination before the 31 st December, 1961, would be entitled to the benefit conferred by the proviso to that sub-section. S.O.R. - Gaz. of Ind., 8-6-1962, Pt. II, S. 2, Ext., p. 250. Act 22 of 1962.- Under the Advocates Act, 1961 a State Bar Council has been empowered to enrol qualified persons as advocates on its roll. In order that a person who has obtained a degree in law may be eligible for such enrolment, he has to undergo a course of training in law and pass an examination thereafter as required by section 24(1)(d) of the Act. The State Bar Councils are required to frame rules for the purpose but they do not have effect, unless they are approved by the Bar Council of India. The persons who passed the final law examination before the 28th February, 1962 were exempted from undergoing the prescribed course of training and examination mainly because all the Bar Councils were not constituted by that time and effective rules for the purpose could not be framed. The Bar Councils have now been constituted but no effective rules for the purpose of prescribing the course of training and examination have yet been made. It may still take some considerable time for all the State Bar Councils to make the necessary rules and get them approved by the Bar Council of India. 2. Difficulties have arisen on account of the inordinate delay in framing the necessary rules. The persons who have passed their final Law examination after the 21th February, 1962 are not able to undergo the necessary training in the absence of proper rules. This is causing undue hardship to them. Representations have been received from various States and Universities urging upon the Government to undertake immediate steps for removing the difficulties experienced by these Law graduates. 3. It is therefore, proposed to amend the Act empowering the Central Government to make rules for State Bar Councils to provide for a course of practical training in law and the examination to be passed after such training. This would be an enabling provision and the Central Government would exercise the power only when it is necessary to do so. When, however, any State Bar Council makes any effective rules for the purpose, the rules made by the Central Government would cease to be in force on a notification issued in this behalf. 4. There are some practising lawyers in Tripura, Manipur and other parts of India who are not legal practitioners under the Legal Practitioners Act, 1879 or the Bombay Pleaders Act, 1920. While the Act provides for the issue or renewal of certificates of practice to legal practitioners under these Acts, difficulties have arisen in the case of lawyers to whom other laws apply Opportunity is being taken to remove this difficulty by making a minor amendment in section 58(4) of the Act. 5. The Bill seeks to achieve these objectives.- S.O.R. - Gaz. of Ind., 13-8-1962, Pt. II. S. 2, Ext., p. 641. Act 21 of 1964.- The working of the Advocates Act, enacted in May, 1961, has revealed certain practical difficulties and representations in this behalf have been received from various State Bar Councils and other Associations. The Bar Council of India has also suggested certain amendments to the Act. Difficulties were being experienced mainly in regard to the functioning of the Bar Councils and the Committees thereof and also in regard to the enrolment as advocates of certain classes of persons who may not fall strictly within the scope of sections 17 and 24 of the Act. It is considered necessary that the Act should be suitably amended for removing such difficulties and for facilitating the implementation of its provisions. 2. The Act provides for the general supervision and control of the Bar Council of India over all State Bar Councils in order that they may, in the exercise of their powers, follow a uniform all-India policy. The powers given to the Bar Council of India in this behalf are, however, inadequate and it is considered necessary to enlarge its powers. It is therefore proposed to empower the Bar Council of India to issue appropriate directions to a State Bar Council or a Committee thereof, and also to exercise powers of revision in relation to any proceeding disposed of by a State Bar Council. It is also proposed to enlarge the appellate jurisdiction of the Bar Council of India. It is further proposed to give wider rule making powers to the Bar Council of India. For the efficient and smooth working of the Act, it is also considered necessary to vest in the Central Government pow- ers to make rules in respect of matters which may be considered necessary. (7) that the disciplinary jurisdiction of State Bar Councils should be extended to certain proceedings which are not at present covered by the Act. 4. The Bill seeks to achieve these objects. Opportunity has also been taken to make certain other amendments of a minor character. 5. The notes on clauses appended to the Bill explain the provisions thereof, - S.O.R. - Gaz. of Ind., 18-4-1964, Pt. II, S. 2, Ext., p. 297. Act 107 of 1976.- "Experience gained in the practical working of the Advocates Act, 1961 has necessitated the following amendments. The Indian High Courts Act, 1861 (commonly known as the Charter Act) passed by the British Parliament enabled the Crown to erect and establish High Courts in India by Letters Patent and these Letters Patent authorised and empowered the high Courts to make rules for enrolment of advocates and attorneys (commonly known as solicitors). Under these rules, a suitor on the original side of the High Courts at Bombay and Calcutta has to approach an advocate only through the conduit of a solicitor. Though the rules of the High Courts have minimised this compulsion recently, complaints have been voiced against the system mainly on the ground that it imposes a double burden on a poor litigant who is required to pay fees to two sets of pro- fessionals and it has been suggested that the two classes of professionals, namely, advocates and solicitors that stand between the law and the lay should be amalgamated into a single class of advocates. It is proposed to give effect to the suggestion by abolishing the dual system with a view to simplifying and streamlining Court procedure, avoiding stratification of the profession and reducing the cost of litigation keeping the needs of the consumer of the legal process as a mutter of paramount importance. Presently out of Rs. 250 paid by an applicant for enrolment as advocate, the share of the apex body, namely, the Bar Council of India is 40 per cent and the remainder is retained by the State Bar Council where he is enrolled. The State Bar Councils have complained that they are hampered for want of funds in implementing welfare schemes like insurance and provident fund for advocates and legal aid to the poor. It is, therefore, proposed that the share of the Bar Council of India in the enrolment fees should be reduced to 20 per cent, from the existing 40 per cent. Under the present scheme of the Advocates Act, 1961, the posts of Chairmen and Vice-Chairmen of the Bar Council of India as well as the State Bar Councils are elective ones. The Attorney-General of India as well as the Advocates-General of States are indubitably leaders in their own rights in the profession as being well-known for their erudition, advocacy, integrity and legal acumen. It is proposed to make these Law Officers ex-officio Chairmen of the Bar Council of India and the State Bar Councils respectively; Solicitor-General of India, the ex-officio Vice-Chairman of the Bar Council of India and the seniormost Advocate from amongst the elected members of a State Bar Council to be the Vice-Chairman of that Council. Representation is sought to be given to the Central Government on the Bar Council of India and a rotational pattern for Chairmanship amongst the Advocates-General is being introduced as respects Bar Councils constituted for territories comprising of more than one State. Hence, the Bill. "- S.O.R. - Gaz. of Ind., 24-8-1976, Pt. II, S. 2. Ext., p.1285. Act 38 of 1977.- "The Advocates (Amendment) Act, 1976 made several changes in the Advocates Act, 1961, According to the amended Act, the Attor- ney-General of India and the Advocates-General of the States became the ex-officio Chairmen of the Bar Council of India and the State Bar Councils, respectively. The Solicitor-General of India became the ex-officio Vice-Chairman of the Bar Council of India; and the seniormost Advocate from among the elected members of the State Bar Council became the Vice-Chairman of the Council. In the case of the State Bar Council of Delhi, an advocate nominated by the Central Government, became the Chairman. The Central Government was also empowered to nominate one officer as a member of the Bar Council of India for a period of two years. 2. This amendment has been criticised by several Bar Councils and members of the public and the legal profession as a retrograde step and as not conducive to the efficient and proper running of the Bar Councils and one which sets at naught the very fundamentals of autonomy of an independent profession. The Central Government has considered the matter de novo and it is proposed to amend the Act to restore the democratic principle of elected Chairman and Vice-Chairman for the Bar Council of India and the State Bar Councils. The provisions empowering the nomination of an officer on the Bar Council of India is also proposed to be omitted. To avoid any disruption in the day-to-day working of the Bar Councils, it is provided that the existing Chairman and Vice-Chairman shall carry on the duties of his respective office till the new Chairman or Vice-Chairman, as the case may be, duly elected, assumes charge of the office. 3. Section 8 of the Act provides for a term of four years for office of elected members of the State Bar Councils. As election to the State Bar Councils is a time-consuming process and involves considerable expenditure the term of office of the members of the State Bar Councils, in relation to which the term has not already expired, is proposed to be increased to five years from the existing four years. 4. One of the major changes brought about by the Advocates (Amendment) Act, 1976, was the abolition of the dual system in the High Courts of Bombay and Calcutta. In Calcutta, however, it was not necessary to possess a Degree in law for a period to enter into agreement of articleship. In order to remove the hardship caused to the articled clerks who have entered into agreement of articleship before the 31st December, 1976 and who have passed the preliminary examination but not passed the Intermediate/Final examination, it is proposed to empower the Calcutta High Court to hold the Intermediate/Final examination up to 31st December, 1980 for the aforesaid articled clerks, and such of those articled clerks who pass the final examination will be eligible to be enrolled as advocates. S. Since Parliament was not in session and urgent action was called for it was considered necessary to issue the Advocates (Amendment) Ordinance, 1977 and the same was promulgated on the 31st October, 1977. 6. This Bill seeks to replace the Ordinance by an Act of Parliament"-S.O.R. - Gaz. of Ind., 18-11-1977, Pt. II, S. 2, Ext., p. 574. Act 47 of 1980, The class of legal practitioners known as attorneys was abolished by the Advocates (Amendment) Act, 1976 and the pre-existing attorneys were required to become advocates under the Advocates Act. With a view to protecting their seniority, it is proposed to amend section 17 of the Advocates Act to provide that the seniority of an attorney who has become an advocate shall be determined by the date of his enrolment as attorney. 2. Under section 23 of the Advocates Act, 1961; the Attorney-General of India, the Solicitor-General of In- dia and the Additional Solicitor-General of India have in that order pre-audience over all other advocates. A second Additional Solicitor-General has been appointed. For the better discharge of the legal business of Government, on the same terms and conditions of service as the Additional Solicitor-General and with the same functions. It is, therefore, proper that his right of pre-audience should be recognised by Statute. Accordingly, it is pro- posed to amend section 23 of the Advocates Act, so as to give him the right of pre-audience immediately after the other three law Officers of the Government of India. 3. The Bill seeks to achieve the above objects. -S.O.R. - Gaz. of Ind., 12-6-1980, Pt. II, S. 2. Ext., p. 418. Act 70 of 1993.- On the basis of various proposals made by the Bar Council of India and certain other bodies and the experience gained in the administration of the Advocates Act, 1961 (25 of 1961), it is found necessary to amend the Act with a view to enabling the Bar Council of India and the State Bar Councils to function more effectively for the betterment of the legal profession. (vi) empower the Supreme Court of India to make rules for determining the persons who shall be entitled to plead before that Court. (n) State roll means a roll of advocates prepared and maintained by State Bar Council under section 17. (f) for the Union territory of Delhi, to be known as the Bar Council of Delhi. [(3) There shall be a Chairman and a Vice-Chairman of each State Bar Council elected by the Council in such manner as may be prescribed. [ (4) An advocate shall be disqualified from voting at an election under sub-section (2) or for being chosen as, and for being, a member of a State Bar Council, unless he possesses such qualifications or satisfies such conditions as may be prescribed in this behalf by the Bar Council of India, and subject to any such rules that may be made, an electoral roll shall be prepared and revised from time to time by each State Bar Council. (c) one member elected by each State Bar Council from amongst its members. [(2) There shall be a Chairman and a Vice-Chairman of the Bar Council of India elected by the Council in such manner as may be prescribed. 5. Bar Council to be body corporate. Every Bar Council shall be a body corporate having perpetual succession and a common seal, with power to acquire and hold property, both movable and immovable, and to contract, and may by the name by which it is known sue and be sued. 6. Functions of State Bar Councils. (i) to do all other things necessary for discharging the aforesaid functions. 7. Functions of Bar Council of India. 8. Term of office of members of State Bar Council. Provided that where a State Bar Council fails to provide for the election of its members before the expiry of the said term, the Bar Council of India may, by order, for reasons to be recorded in writing, extend the said term for a period not exceeding six months. to discharge the functions of the State Bar Council until the Bar Council is constituted under this Act. (c) all proceedings pending before the State Bar Council in respect of any disciplinary matter or otherwise, shall stand transferred to the Special Committee. (1) A Bar Council shall constitute one or more disciplinary committees, each of which shall consist of three persons of whom two shall be persons elected by the Council from amongst its members and the other shall be a person co-opted by the Council from amongst advocates who possess the qualifications specified in the proviso to sub-section (2) of section 3 and who are not members of the Council, and the senior-most advocate amongst the members of a disciplinary committee shall be the Chairman thereof. [9-A. Constitution of legal aid committees . (1) A Bar Council may constitute one or more legal aid committees each of which shall consist of such number of members, not exceeding nine but not less than five, as may be prescribed. 10. Constitution of committees other than disciplinary committees. (b) an enrolment committee consisting of three members elected by the Council from amongst its members. (b) a legal education committee consisting of ten members, of whom five shall be persons elected by the Council from amongst its members and five shall be persons co-opted by the Council who are not members thereof. (3) a State Bar Council and the Bar Council of India may constitute from amongst its members such other committees as it may deem necessary for the purpose of carrying out the provisions of this Act. [10-A. Transaction of business by Bar Councils and committees thereof . [(1) The Bar Council of India shall meet at New Delhi or at such other place as it may, for reasons to be recorded in writing, determine. (3) The committees other than disciplinary committees constituted by the Bar Councils shall meet at the headquarters of the respective Bar Councils. (5) The disciplinary committees constituted under section 9 shall meet at such times and places and shall observe such rules of procedure in regard to the transaction of business at their meetings as may be prescribed. 11. Staff of Bar Council. (1) Every Bar Council shall appoint a Secretary and may appoint an accountant and such number of other persons on its staff as it may deem necessary. (2) The Secretary and the accountant, if any, shall possess such qualifications as may be prescribed. (1) Every Bar Council shall cause to be maintained such books of accounts and other books in such form and in such manner as may be prescribed. (2) The accounts of a Bar Council shall be audited by auditors duly qualified to act as auditors of companies under the Companies Act, 1956 (1 of 1956), at such times and in such manner as may be prescribed. (4) As soon as may be practicable at the end of each financial year, but not later than the 31st day of December of the year next following, the Bar Council of India shall send a copy of its accounts together with a copy of the report of the auditors thereon to the Central Government and shall cause the same to be published in the Gazette of India. 13. Vacancies in Bar Council and committees thereof not to invalidate action taken. No acts done by a Bar Council or any committee thereof shall be called in question on the ground merely of the existence of any vacancy in, or any defect in the constitution of, the Council or committee, as the case may be. 14. Election to Bar Councils not to be questioned on certain grounds. No election of a member to a Bar Council shall be called in question on the ground merely that due notice thereof has not been given to any person entitled to vote thereat, if notice of the date has, not less than thirty days before that date, been published in the Official Gazette. 15. Power to make rules. (1) A Bar Council may make rules to carry out the purposes of this Chapter. (n) the management and investment of the funds of the Bar Council. (3) No rules made under this section by a State Bar Council shall have effect unless they have been approved by the Bar Council of India. (1) There shall be two classes of advocates, namely, senior advocates and other advocates. (2) An advocate may, with his consent, be designated as senior advocate if the Supreme Court or a High Court is of opinion that by virtue of his ability [standing at the Bar or special knowledge or experience in law] he is deserving of such distinction. (3) Senior advocates shall, in the matter of their practice, be subject to such restrictions as the Bar Council of India may, in the interest of the legal profession, prescribe. [Provided that where any such senior advocate makes an application before the 31st December, 1965 to the Bar Council maintaining the roll in which his name has been entered that he does not desire to continue as a senior advocate, the Bar Council may grant the application and the roll shall be altered accordingly. (b) all other persons who are admitted to be advocates on the roll of the State Bar Council under this Act on or after the appointed day. (2) Each such roll of advocates shall consist of two parts, the first part containing the names of senior advocates and the second part, the names of other advocates. (4) No person shall be enrolled as an advocate on the roll of more than one State Bar Council. 19. State Bar Councils to send copies of rolls of advocates to the Bar Council of India. Every State Bar Council shall send to the Bar Council of India an authenticated copy of the roll of advocates prepared by it for the first time under this Act and shall thereafter communicate to the Bar Council of India all alterations in, and additions to, any such roll, as soon as the same have been made. (1) Notwithstanding anything contained in this Chapter, every advocate who was entitled as of right to practise in the Supreme Court immediately before the appointed day and whose name is not entered in any State roll may, within the prescribed time, express his intention in the prescribed form to the Bar Council of India for the entry of his name in the roll of a State Bar Council and on receipt thereof the Bar Council of India shall direct that the name of such advocate shall, without payment of any fee, be entered in the roll of that State Bar Council, and the State Bar Council concerned shall comply with such direction. (3) Where an advocate referred to in sub-section (1) omits or fails to express his intention within the prescribed time, his name shall be entered in the roll of the State Bar Council of Delhi. (1) Where the date of seniority of two or more persons is the same, the one senior in age shall be reckoned as senior to the other. (1) There shall be issued a certificate of enrolment in the prescribed form by the State Bar Council to every person whose name is entered in the roll of advocates maintained by it under this Act. (1) The Attorney-General of India shall have pre-audience over all other advocates. (2) Subject to the provisions of sub-section (1), the Solicitor-General of India shall have pre-audience over all other advocates. (3) Subject to the provisions of sub-sections (1) and (2), the Additional Solicitor-General of India shall have pre-audience over all other advocates. (4) Subject to the provisions of sub-sections (1), [(2), (3) and (3-A)] , the Advocate-General of any State shall have pre-audience over all other advocates, and the right of pre-audience among Advocates-General inter se shall be determined by their respective seniority. (ii) the right of pre-audience of senior advocates and other advocates inter se shall be determined by their respective seniority. Advocates Act 1961 Section 24. Persons who may be admitted as advocates on a State roll. Provided that where such person is a member of the Scheduled Castes or the Scheduled Tribes and produces a certificate to that effect from such authority as may be prescribed, the enrolment fee payable by him to the State Bar Council shall be [one hundred rupees and to the Bar Council of India, twenty-five rupees] . (b) fulfils the conditions specified in clauses (a), (b), (e) and (f) of sub-section (1). (ii) fulfils the conditions specified in clauses (a), (b), (e) and (f) of sub-section (1). [ (c) if he is dismissed or removed from employment or office under the State on any charge involving moral turpitude. 25. Authority to whom applications for enrolment may be made. An application for admission as an advocate shall be made in the prescribed form to the State Bar Council within whose jurisdiction the applicant proposes to practise. 26. Disposal of applications for admission as an advocate. (2) Where the enrolment committee of a State Bar Council proposes to refuse any such application, it shall refer the application for opinion to the Bar Council of India and every such reference shall be accompanied by a statement of the grounds in support of the refusal of the application. (3) The enrolment committee of a State Bar Council shall dispose of any application referred to the Bar Council of India under sub-section (2) in conformity with the opinion of the Bar Council of India. [(4) Where the enrolment committee of a State Bar Council has refused any application for admission as an advocate on its roll, the State Bar Council shall, as soon as may be, send intimation to all other State Bar Councils about such refusal stating the name, address and qualifications of the person whose application was refused and the grounds for the refusal. 26-A. Power to remove names from roll. 27. Application once refused not to be entertained by another Bar Council except in certain circumstances. Where a State Bar Council has refused the application of any person for admission as an advocate on its roll, no other State Bar Council shall entertain an application for admission of such person as an advocate on its roll, except with the previous consent in writing of the State Bar Council which refused the application and of the Bar Council of India. 29. Advocates to be the only recognised class of persons entitled to practise law. Subject to the provisions of this Act and any rules made thereunder, there shall, as from the appointed day, be only one class of persons entitled to practise the profession of law, namely, advocates. Section 30. Right of advocates to practise. (iii) before any other authority or person before whom such advocate is by or under any law for the time being in force entitled to practise. 31. Special provision for attorneys. 32. Power of Court to permit appearances in particular cases. Notwithstanding anything contained in this Chapter, any Court, authority, or person may permit any person, not enrolled as an advocate under this Act, to appear before it or him in any particular case. 33. Advocates alone entitled to practise . Except as otherwise provided in this Act or in any other law for the time being in force, no person shall, on or after the appointed day, be entitled to practise in any Court or before any authority or person unless he is enrolled as an advocate under this Act. 34. Power of High Courts to make rules. (1) The High Court may make rules laying down the conditions subject to which an advocate shall be permitted to practise in the High Court and the Courts subordinate thereto. Section 35. Punishment of advocates for misconduct. (2) The disciplinary committee of a State Bar Council shall fix a date for the hearing of the case and shall cause a notice thereof to be given to the advocate concerned and to the Advocate-General of the State. Section 36. Disciplinary powers of Bar Council of India . (2) Notwithstanding anything contained in this Chapter, the disciplinary committee of the Bar Council of India may, [either of its own motion or on a report by any State Bar Council or on an application made to it by any person interested] , withdraw for inquiry before itself any proceedings for disciplinary action against any advocate pending before the disciplinary committee of any State Bar Council and dispose of the same. (3) The disciplinary committee of the Bar Council of India, in disposing of any case under this section, shall observe, so far as may be, the procedure laid down in section 35, the references to the Advocate-General in that section being construed as references to the Attorney-General of India. (4) In disposing of any proceedings under this section the disciplinary committee of the Bar Council of India may make any order which the disciplinary committee of a State Bar Council can make under sub-section (3) of section 35, and where any proceedings have been withdrawn for inquiry [before the disciplinary committee of the Bar Council of India] , the State Bar Council concerned shall give effect to any such order. 36-A. Changes in constitution of disciplinary committees. Whenever in respect of any proceedings under section 35 or section 36, a disciplinary committee of the State Bar Council or a disciplinary committee of the Bar Council of India ceases to exercise jurisdiction and is succeeded by another committee which has and exercises jurisdiction, the disciplinary committee of the State Bar Council or the disciplinary committee of the Bar Council of India, as the case may be, so succeeding may continue the proceedings from the stage at which the proceedings were so left by its predecessor committee. 36-B. Disposal of disciplinary proceedings. (1) The disciplinary committee of a State Bar Council shall dispose of the complaint received by it under section 35 expeditiously and in each case the proceedings shall be concluded within a period of one year from the date of the receipt of the complaint or the date of initiation of the proceedings at the instance of the State Bar Council, as the case may be, failing which such proceedings shall stand transferred to the Bar Council of India which may dispose of the same as if it were a proceeding withdrawn for inquiry under sub-section (2) of section 36. 37. Appeal to the Bar Council of India . (1) Any person aggrieved by an order of the disciplinary committee of a State Bar Council made [under section 35] [or the Advocate-General of the State] may, within sixty days of the date of the communication of the order to him, prefer an appeal to the Bar Council of India. 38. Appeal to the Supreme Court . 39. Application of sections 5 and 12 of Limitation Act, 1963. [(1)] An appeal, made under section 37 or section 38, shall not operate as a stay of the order appealed against, but the disciplinary committee of the Bar Council of India, or the Supreme Court, as the case may be, may, for sufficient cause, direct the stay of such order on such terms and conditions as it may deem fit. and where any order is made removing an advocate from practice, his name shall be struck off the State roll . (3) Where any advocate is suspended or removed from practice, the certificate granted to him under section 22, in respect of his enrolment shall be recalled. 42. Powers of disciplinary committee. (b) any officer of a revenue Court except with the previous sanction of the State Government. (3) For the purposes of exercising any of the powers conferred by sub-section (1), a disciplinary committee may send to any Civil Court in the territories to which this Act extends, any summons or other process, for the attendance of a witness or the production of a document required by the committee or any commission which it desires to issue, and the Civil Court shall cause such process to be served or such commission to be issued, as the case may be, and may enforce any such process as if it were a process for attendance or production before itself. Provided that no final orders of the nature referred to in sub-section (3) of section 35 shall be made in any proceeding unless the Chairman and other members of the disciplinary committee are present. 43. Cost of proceedings before a disciplinary committee. (b) in the case of an order of the disciplinary committee of a State Bar Council, of the High Court. 44. Review of orders by disciplinary committee. Provided that no such order of review of the disciplinary committee of a State Bar Council shall have effect unless it has been approved by the Bar Council of India. 45. Penalty for persons illegally practising in Courts and before other authorities. Any person who practises in any Court or before any authority or person, in or before whom he is not entitled to practise under the provisions of this Act, shall be punishable with imprisonment for a term which may extend to six months. 46. Payment of part of enrolment fees to the Bar Council of India. (1) Where any country, specified by the Central Government in this behalf by notification in the Official Gazette, prevents citizens of India from practising the profession of law or subjects them to unfair discrimination in that country, no subject of any such country shall be entitled to practise the profession of law in India. (2) Subject to the provisions of sub-section (1), the Bar Council of India may prescribe the conditions, if any, subject to which foreign qualifications in law obtained by persons other than citizens of India shall be recognised for the purpose of admission as an advocate under this Act. 48. Indemnity against legal proceedings. No suit or other legal proceeding shall lie against any Bar Council [or any committee thereof] or a member of a Bar Council or any committee thereof for any act in good faith done or intended to be done in pursuance of the provisions of this Act or of any rules made thereunder. [48-A. Power of revision . (1) The Bar Council of India may, at any time, call for the record of any proceeding under this Act which has been disposed of by a State Bar Council or a committee thereof, and from which no appeal lies, for the purpose of satisfying itself as to the legality or propriety of such disposal and may pass such orders in relation thereto as it may think fit. [48-B. Power to give directions . (1) For the proper and efficient discharge of the functions of a State Bar Council or any committee thereof, the Bar Council of India may, in the exercise of its powers of general supervision and control, give such directions to the State Bar Council or any committee thereof as may appear to it to be necessary, and the State Bar Council or the committee shall comply with such directions. 49. General power of the Bar Council of India to make rules. [Provided further that] no rules made with reference to clause (e) shall have effect unless they have been approved by the Central Government. [49-A. Power of Central Government to make rules . (1) The Central Government may, by notification in the Official Gazette make rules for carrying out the purposes of this Act including rules with respect to any matter for which the Bar Council of India or a State Bar Council has power to make rules. (3) Rules under this section may be made either for the whole of India or for all or any of the Bar Councils. (4) If any provision of a rule made by a Bar Council is repugnant to any provision of a rule made by the Central Government under this section, then, the rule under this section, whether made before or after the rule made by the Bar Council, shall prevail and the rule made by the Bar Council shall, to the extent of the repugnancy, be void. (1) On the date on which a State Bar Council is constituted under this Act, the provisions of sections 3 to 7 (inclusive), sub-sections (1), (2) and (3) of section 9, section 15 and section 20 of the Indian Bar Councils Act, 1926 (38 of 1926), shall stand repealed in the territory for which the State Bar Council is constituted. (d) the provisions of the Letters Patent of any High Court and of any other law insofar as they relate to the admission and enrolment of legal practitioners. (e) the provisions of the Letters Patent of any High Court and of any other law conferring on legal practitioners the right to practise in any Court or before any authority or person. (d) the provisions of the Letters Patent of any High Court and of any other law insofar as they relate to the suspension, removal or dismissal of legal practitioners. (b) the enactments specified in the Schedule shall stand repealed to the extent mentioned therein. On and from the appointed day, references in any enactment to an advocate enrolled by a High Court in any form of words shall be construed as references to an advocate enrolled under this Act. (b) for determining the persons who shall be entitled to[act or plead] in that Court. 53. Elections to first State Bar Council. Notwithstanding anything contained in this Act, the elected members of a State Bar Council, constituted for the first time under this Act, shall be elected by and from amongst advocates, vakils, pleaders and attorneys who, on the date of the election, are entitled as of right to practise in the High Court and are ordinarily practising within the territory for which the Bar Council is to be constituted. Explanation. Where the territory for which the Bar Council is to be constituted includes a Union territory, the expression High Court shall include the Court of the Judicial Commissioner of that Union territory. 54. Term of office of members of first State Bar Councils. 55. Rights of certain existing legal practitioners not affected. shall, notwithstanding the repeal by this Act of the relevant provisions of the Legal Practitioners Act, 1879 (18 of 1879), the Bombay Pleaders Act, 1920 (Bombay Act 17 of 1920), or other law, continue to enjoy the same rights as respects practice in any Court or revenue office or before any authority or person and be subject to the disciplinary jurisdiction of the same authority which he enjoyed or, as the case may be, to which he was subject immediately before the said date and accordingly the relevant provisions of the Acts or law aforesaid shall have effect in relation to such persons as if they had not been repealed. 56. Dissolution of existing Bar Councils. (c) all proceedings pending before the corresponding Bar Council in respect of any disciplinary matter or otherwise shall stand transferred to the new Bar Council. (2) In this section, corresponding Bar Council in relation to a State Bar Council, other than the Bar Council of Delhi, means the Bar Council for the High Court in territory for which the State Bar Council is constituted under this Act. 57. Power to make rules pending the constitution of a Bar Council. (b) in the case of a State Bar Council, by the High Court. 58. Special provisions during the transitional period. (1) Where a State Bar Council has not been constituted under this Act or where a State Bar Council so constituted is unable to perform its functions by reason of any order of a Court or otherwise, the functions of that Bar Council[or of any Committee thereof, insofar as they relate to the admission and enrolment of advocates, shall be performed by the High Court in accordance with the provisions of this Act. (2) Until Chapter IV comes into force, a State Bar Council or a High Court performing the functions of a State Bar Council may enrol any person to be an advocate on a State roll, if he is qualified to be so enrolled under this Act, notwithstanding that no rules have been made under section 28 or that the rules so made have not been approved by the Bar Council of India, and every person so enrolled shall, until that Chapter comes into force, be entitled to all the rights of practice conferred on an advocate under section 14 of the Indian Bar Councils Act, 1926 (38 of 1926). (3) Notwithstanding anything contained in this Act, every person who, immediately before the 1st day of December, 1961, was an advocate on the roll of any High Court under the Indian Bar Councils Act, 1926 (38 of 1926), or who has been enrolled as an advocate under this Act shall, until Chapter IV comes into force, be entitled as of right to practise in the Supreme Court, subject to the rules made by the Supreme Court in this behalf. [58-A. Special provisions with respect to certain advocates . (1) Notwithstanding anything contained in this Act, all advocates who, immediately before the 26th day of July, 1948, were entitled to practise in the High Court in Allahabad or the Chief Court in Oudh and who under the provisions of the United Provinces High Courts (Amalgamation) Order, 1948 were recognised as advocates entitled to practise in the new High Court of Judicature at Allahabad but whose names were not formally entered on the roll of advocates of that High Court merely by reason of the non-payment of the fee payable to the Bar Council of the said High Court, and all advocates who were enrolled as such between the said date and the 26th day of May, 1952, shall, for the purposes of clause (a) of sub-section (1) of section 17 be deemed to be persons who were entered as advocates on the roll of the said High Court under the Indian Bar Councils Act, 1926 (38 of 1926), and every such person may, on an application being made in this behalf, be admitted as an advocate on the State roll of Uttar Pradesh. (2) Notwithstanding anything contained in this Act, all advocates who, immediately before the 10th day of October, 1952, were entitled to practise in the High Court of Hyderabad but whose names were not formally entered on the roll of advocates of that High Court merely by reason of the non-payment of the fee payable to the Bar Council of the said High Court shall, for the purposes of clause (a) of sub-section (1) of section 17, be deemed to be persons who were entered as advocates on the roll of the said High Court under the Indian Bar Councils Act, 1926 (38 of 1926), and every such person may, on an application being made in this behalf, be admitted as an advocate on the State roll of Andhra Pradesh or of Maharashtra. (3) Notwithstanding anything contained in this Act, all advocates who, immediately before the 1st day of May, 1960, were entitled to practise in the High Court of Bombay and who applied to get their names entered on the roll of advocates of the High Court of Gujarat under the provisions of section 8 of the Indian Bar Councils Act, 1926 (38 of 1926), but whose names were not so entered by reason of the repeal of the said provision shall, for the purposes of clause (a) of sub-section (1) of section 17, be deemed to be persons who were entered as advocates on the roll of the High Court of Gujarat under the said Act and every such person may, on an application being made in this behalf, be admitted as an advocate on the State roll of Gujarat. [58-AA. Special provisions in relation to the Union territory of Pondicherry.] . (1) Notwithstanding anything contained in this Act, all persons who, immediately before the date on which the provisions of Chapter III are brought into force in the Union territory of Pondicherry, were entitled to practise the profession of law (whether by way of pleading or acting or both) under any law in force in the said Union territory or who would have been so entitled had they not been in public service on the said date, shall for the purposes of clause (a) of sub-section (1) of section 17, be deemed to be persons who were entered as advocates on the roll of a High Court under the Indian Bar Councils Act, 1926 (38 of 1926), and every such person may, on an application made in this behalf within such time as may be specified by the Bar Council of Madras, be admitted as an advocate on the State roll maintained in respect of the said Union territory. (2) Notwithstanding anything contained in this Act, every person who, immediately before the date on which the provisions of Chapter IV are brought into force in the Union territory of Pondicherry, was practising the profession of law (whether by way of pleading or acting or both or in any other way) by virtue of the provisions of any law in force in the said Union territory, who does not elect to be or is not qualified to be, enrolled as an advocate under sub-section (1), shall, notwithstanding the repeal of the relevant provisions of such law by the Pondicherry (Extension of Laws) Act, 1968 (26 of 1968), continue to enjoy the same rights as respects practice in any Court or revenue office or before any authority or person and be subject to the disciplinary jurisdiction of the same authority which he enjoyed, or, as the case may be, to which he was subject, immediately before the said date and accordingly the relevant provisions of the law aforesaid shall have effect in relation to such persons as if they had not been repealed. [58-AC. Special provisions with respect to certain persons enrolled by Uttar Pradesh State Bar Council] .Notwithstanding anything contained in this Act or any judgment, decree or order of any Court, every person who was enrolled as an advocate by the High Court during the period beginning with the 2nd day of January, 1962 and ending on the 25th day of May, 1962 and was subsequently admitted as an advocate on the State roll by the State Bar Council of Uttar Pradesh shall be deemed to have been validly admitted as an advocate on that State roll from the date of his enrolment by the High Court and accordingly entitled to practise the profession of law (whether by way of pleading or acting or both). and notwithstanding the repeal by this Act of the relevant provisions of such Act or law, every pleader, mukhtar or revenue agent so enrolled shall have the same rights as respects practice in any Court or revenue office or before any other authority or person and be subject to the disciplinary jurisdiction of the same authority to which he would be subject under the relevant provisions of such Act or law as if they had been repealed and accordingly, those provisions shall have effect in relation to such persons. Provided that the provisions of this sub-section shall not apply to any person who, on the date of the application aforesaid, was not a citizen of India. (2) Notwithstanding anything contained in this Act, every person who, immediately before the date on which the provisions of Chapter IV are brought into force in the Union territory of Goa, Daman and Diu, was practising the profession of law (whether by way of pleading or acting or both or in any other way) by virtue of the provisions of any law in force in the said Union territory, or who does not elect to be or is not qualified to be enrolled as an advocate under sub-section (1), shall, notwithstanding the repeal by this Act of the relevant provisions of such law, continue to enjoy the same rights as respects practice in any Court or revenue office or before any other authority or person and be, subject to the disciplinary jurisdiction of the same authority which he enjoyed, or, as the case may be, to which he was subject, immediately before the said date and accordingly the relevant provisions of the law aforesaid shall have effect in relation to such persons as if they had not been repealed. (3) On the date on which this Act or any part thereof comes into force in the Union territory of Goa, Daman and Diu, the law in force in that Union territory which corresponds to this Act or such part and which does not stand repealed by virtue of the provisions of section 50 of this Act, shall also stand repealed. 58-AF. Special provisions in relation to Jammu and Kashmir . (1) Notwithstanding anything contained in this Act, all advocates who, immediately before the date on which the provisions of Chapter III are brought into force in the State of Jammu and Kashmir, were entitled to practise in the High Court of that State, or who would have been so entitled had they not been in public service on the said date, shall, for the purpose of the clause (a) of sub-section (1) of section 17, be deemed to be persons who were entered as advocates on the roll of a High Court under the Indian Bar Councils Act, 1926 (38 of 1926), and every such person may, on an application made in this behalf within such time as may be specified by the Bar Council of India, be admitted as an advocate on the State roll maintained in respect of the said State. (ii) fulfils the conditions specified in clauses (a), (b), (e) and (f) of sub-section (1) of section 24. (3) Notwithstanding anything contained in this Act, every person who, immediately before the date on which the provisions of Chapter IV are brought into force in the State of Jammu and Kashmir, was practising the profession of law (whether by way of pleading or acting or both or in any other way) by virtue of the provisions of any law in force therein, or who does not elect to be or is not qualified to be enrolled as an advocate under sub-section (1) or sub-section (2), shall, notwithstanding the repeal by this Act of the relevant provisions of such law, continue to enjoy the same rights as respects practice in any Court or revenue office or before any other authority or person and be subject to the disciplinary jurisdiction of the same authority which he enjoyed, or, as the case may be, to which he was subject, immediately before the said date and accordingly the relevant provisions of the law aforesaid shall have effect in relation to such persons as if they had not been repealed. (4) On the date on which this Act or any part thereof comes into force in the State of Jammu and Kashmir, the law in force in that State which corresponds to this Act or such part thereof which does not stand repealed by virtue of the provisions of section 50 of this Act, shall also stand repealed. (b) the Intermediate and the Final examinations in any other case. [58-B. 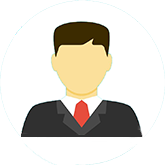 Special provision relating to certain disciplinary proceedings . (1) As from the 1st day of September, 1963, every proceeding in respect of any disciplinary matter in relation to an existing advocate of a High Court shall, save as provided in the first proviso to sub-section (2), be disposed of by the State Bar Council in relation to that High Court, as if the existing advocate had been enrolled as an advocate on its roll. Provided further that where the High Court has referred back any case for further inquiry under sub-section (4) of section 12 of the said Act, the proceeding shall stand transferred to the State Bar Council in relation to the High Court as if it were a proceeding pending before the corresponding Bar Council under clause (c) of sub-section (1) of section 56. (3) If immediately before the said date there is any proceeding in respect of any disciplinary matter pending in relation to any pleader, vakil, mukhtar or attorney, who has been enrolled as an advocate on any State roll under the Act, such proceeding shall stand transferred to the State Bar Council on the roll of which he has been enrolled and be dealt with under this Act as if it were a proceeding arising against him thereunder. (4) In this section existing advocate means a person who was enrolled as an advocate on the roll of any High Court under the Indian Bar Councils Act, 1926 (38 of 1926) and who, at the time when any proceeding in respect of any disciplinary matter is initiated against him, is not enrolled as an advocate on a State roll under this Act. 59. [ Removal of difficulties . (1) If any difficulty arises in giving effect to the provisions of this Act, particularly in relation to the transition from the enactments repealed by this Act to the provisions of this Act, the Central Government may, by order published in the Official Gazette, make such provisions not inconsistent with the purposes of this Act, as appear to it to be necessary or expedient for removing the difficulty. [60. Powers of Central Government to make rules . (1) Until rules in respect of any matter under this Act are made by a State Bar Council and approved by the Bar Council of India, the power to make rules in respect of that matter shall be exercisable by the Central Government. (2) The Central Government after consultation with the Bar Council of India may, by notification in the Official Gazette, make rules under sub-section (1) either for any State Bar Council or generally for all State Bar Councils and the rules so made shall have effect, notwithstanding anything contained in this Act. The States Reorganisation Act, 1956 (37 of 1956). The Bombay Reorganisation Act, 1960 (11 of 1960). In case you are looking for the downloadable pdf version of the Advocates act 1961, just click the link above to download the pdf version, readable in adobe acrobat reader. This online webpage contains the amendments that took place in year 1976 in the advocates act 1961. To find out the 1976 amendments, press Ctrl + F buttons and search for "1976". In case you are looking for the new changes in the rules, that allow the advocates to advertise their field of service (as mentioned in newspaper article on linked page), click the link above. Great work. Thanks for compiling a set of bare acts.